I have followed the debate about deafness and cochlear implants since the procedure was first successfully introduced. I assumed that the deaf would be overjoyed that they could finally hear. A cochlear implant was no different from and as beneficial to the quality of life as a pacemaker, insulin pump, or bionic knee. The negative reaction of the deaf community, however, was surprisingly loud and angry. Cochlear implants – fixing deafness – represented a divisive, disruptive, and ultimately destructive blow to the political solidarity which the deaf community had achieved. The deaf would no longer march in lockstep. More importantly the deaf community would lose its language, ASL, its culture, and its uniqueness. In other words, cultural identity – diversity – was more important than restoring the deaf to a natural, biologically superior, majority state. Cochlear implants rely on internal implants and external receivers. The Massachusetts Institute of Technology (MIT) is developing an entirely internal cochlear implant. Users would charge the device wirelessly; the prototype charger plugs into a cell phone and charges the implant in two minutes. This middle-ear technology created by MIT, Harvard University, and the Massachusetts Eye and Ear Infirmary has already been tested on a few patients, who were able to hear with it. The University of Utah has also previously worked on a microphone that can be implanted in the middle ear. Once again, my first reaction was overwhelmingly positive. Not only would deafness be cured or remediated, but there would be no visible signs of disability. The formerly deaf individual would be able to be fully integrated into a society notorious for its suspicion and marginalization of the disabled. To deaf political activists, however, this is the final blow to the deaf community. Once the profoundly deaf become just like the 99.99 percent (approximately one million out of a total of 300 million) of other Americans and indistinguishable from them, the deaf community will disappear. This should be a matter for rejoicing – a scientific breakthrough that improves the lives of many, eliminates disability, and enables hundreds of thousands of people to fully participate in the world of the hearing – but diversity, identity politics, and inclusivity have poisoned the well. So much emphasis has been placed on identifying and preserving cultural uniqueness that increasingly insular minority groups have been deterred from fully joining the American mainstream. Bi-lingual education may preserve some aspects of ethnic culture, but early mastery of English is the key to fast-track social, political, and economic inclusion. Competitive admissions policies may limit matriculation to four-year colleges and universities to only the most talented, but will redirect those less qualified to lower-tier and more appropriate educational institutions. Such matching of ability and opportunity will eventually lead to higher performance and economic integration. A young friend of mine was required to take diversity training as part of her new job. On the first day, every new employee was asked to line up behind the sign which best described them – white, black, male, female, gay, straight, old, young….and many more. The purpose of the exercise was to emphasize and ‘celebrate’ diversity; but in fact it simply reinforced insularity and narrow conceptions of self. Except for the incessant and tiring diversity drumbeat of social ‘progressives’, most people would not categorize themselves at all – at least not in the artificially-constructed categories devised with a political purpose. The deaf community may feel empowered by being a recognized and politically active minority; and may well feel a certain sense of bonding and solidarity with others who share the same disability; but such inwardness has its serious downside. Blacks, women, Latinos, and LGBTs on campus are encouraged to form their own exclusive social clubs and engage in their own activities and to value these associations and events as more meaningful than those of the majority. This exclusivity only serves to cut them off from the wider, fuller, and more rewarding world of the majority. The deaf have followed suit. The idea is to become fully integrated into American society as quickly as possible; to fully subscribe to prevalent majority values, principles, and ideals; and to enjoy the advantages and benefits of an open society. The early generations of immigrants to America – Jews, Italians, Irish, and Poles – learned this lesson early. After one generation, only the amusing and iconic cultural bits remain - the blarney, pasta fazool, kielbasa, and funny Borscht Belt shtick. There is nothing wrong with preserving a certain cultural identity, but how much and for what purpose? Does being an Italian-American really mean anything today? Europeans are now dealing with the issue of diversity for the first time, and they have no idea how to deal with it. The French in the name of Liberté, Egalité, Fraternité have ignored racial and ethnic divisions and the increasingly restive African populations in the northern suburbs. Scandinavia’s legendary tolerance is cracking under the weight of immigrants who refuse to integrate. The Danes are not sure what to do – tolerate ‘diversity’ even though tightly-knit, politically active ethnic and religious groups threaten the body politic? Or insist on integration – Love It or Leave It. A nation cannot survive if it consists of pockets of resistance – citizens who militantly retain all aspects of their culture and arrogantly dismiss those of their host country. 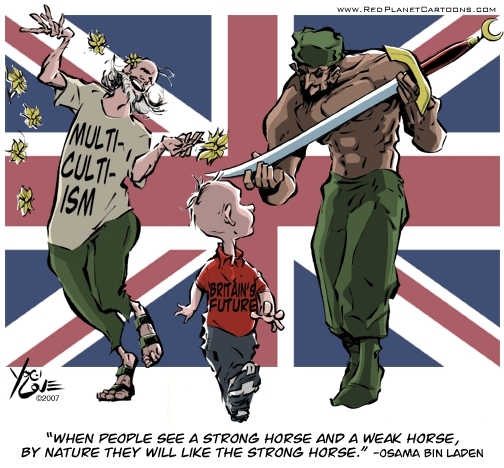 Even the ethnically mixed Britons are becoming restive. Exclusivity (or ‘inclusivity’ in the politically correct lexicon) is dangerous, explosive, and at best counter-productive to national and individual interests. The nation-state may eventually fracture into ethnic parts; but until it does there is an obligation on the part of both Establishment and new arrivals to promote and ensure integration. It appears that the deaf community has been coopted by an idealistic and misinformed ‘progressive’ and politically correct agenda of diversity. There is no advantage to preserving deafness for its own sake, no more than blindness or any other physical disability. There is an advertisement for a shoe company which shows a bunch of athletes playing basketball in wheelchairs. At the end of the commercial, all but the real disabled player stand up and walk out with him wheeling alongside. This is all well and good, and messages of tolerance are essential….until that man can get up out of his wheelchair and play on his own. Fortunately even the worst paralysis now can be reversed through remarkable neuro-electronic advances. There was a recent viral video of a profoundly deaf woman at the moment when the cochlear switch was turned on. Suddenly after decades of deafness, she could hear the sounds around her – the shuffle of shoes, the rustling of paper, voices, the hum of the tube lights, the low rumble of the traffic outside. Later she recorded some of the more unpleasant aspects of being able to hear. The hearing world was a very noisy, irritating place and she felt the need to retreat into her previously quiet and peaceful one. More than likely she – like many others – quickly get over the shock and merge easily into hearing society. The solidarity of the deaf community will certainly be fractured as the profoundly deaf leave it for the hearing world. The community served its purpose, but that purpose was temporary; and now that the deaf can hear, it should move quietly into the background. Identity politics is never in anyone’s interest. It may feel good in the short term, especially if a minority group has been deliberately segregated and marginalized, but it hurts in the long run.